Are you quantifying ‘time saved’ across every stage of your travel policy? In this article, we explore the why, when, and how to track this important metric. In the pursuit of efficiencies and leaner spend, senior management can sometimes lose sight of the significance of time saved on the company’s bottom line. However, direct program dollars and cents aren’t the only way to measure savings. Tracking the less-obvious “time saved” metric can translate into hard numbers and even greater savings company-wide. Think about how powerful it will be when you go into your next financial review, and you can show that by making these 3 tweaks to your program, you’ve not only directly saved X or Y percentage over the previous quarter, you’ve also indirectly saved X many hours, which translates to real dollars for your team, and your travelers too. In this blog post, we explore why saving time is so important for the health of your company’s travel, and identify some easy ways anyone managing business travel can trim time from expensing, processing, and the actual trip taken. Time is money. Benjamin Franklin may have coined the adage way back in 1748, but there’s a reason this principle has withstood the test of time. Saving time is not a theoretical concept — it’s quantifiable. Tracked time is easily converted into dollars when measured against an employee’s salary or a department’s budget. Days spent on the road, time spent submitting expense reports, and hours spent processing those claims costs money to complete. Why would your company want to spend money on the time which could have been spent finishing important projects? All stakeholders, from entry-level employees to senior-level management, benefit from efforts made to save time in the company’s travel program. Those time savings reverberate through every department, as employees shift their focus from the administrative burden of traveling, expensing, and processing to completing more important tasks which advance and grow your company. That includes you as a manager of travel too! When it comes down to it, less admin means more time to work smarter, not harder. What could you do with an extra 5-10 hours per week or more? More time to think strategically, and build out your plan to innovate and future-proof your travel policy or even more time to simply to explore industry best practice. Where can saving time have the biggest impact? Each step of the corporate travel process presents new, effective opportunities to trim time, and more importantly, track and report on the savings you make. It’s worth repeating–clarity and communication go a long way to reduce questions, hesitations, and poor decisions as your travelers start to book their travel before a work trip or head to an off-site meeting. A well-written, easy-to-access travel policy clarifies all your guidelines out the gate, avoiding time-wasting repetition and time-consuming mistakes which need to be fixed during reimbursement processing. Actual time spent traveling should be taken into account as well. Sure, a flight with a 2-hour layover may save the company $150, but does your traveler lose $150 in productivity, or more, in the process? Valuable projects could have been completed in the same time it took to dart between planes. Quantify: Look at the metric of how long it takes your travelers on average to book a trip–can making your policy clearer at the beginning save time here, or reduce time back and forth when a policy is violated? Look at a sample of flights to see how a reduction of layovers could save valuable hours. Take action: See your travel policy as a way to save time and money. Start by re-evaluating how you share information about your travel program. Consider easily-accessible FAQs to quickly and clearly communicate policies, and be sure the link is easy to find and remember. There’s a reason you’ve heard the word automation a lot over the last few years–it’s having a real impact on process and budgets, and business travel can’t afford to miss out. Which solutions are available to automate expensing on the road? This could involve separating business profiles in existing popular apps, or setting up a central billing with providers like Uber for Business to eliminate the need to report certain expense types altogether. Travelers can instead jump back into important projects instead of filling out expense reports. Quantify: When it comes to evaluating the impact of automation on-trip, the simplest way to quantify is to observe a sample group of travelers completing the tasks you’re looking to eliminate, using a new system, and then multiply the impact across your full traveler base. 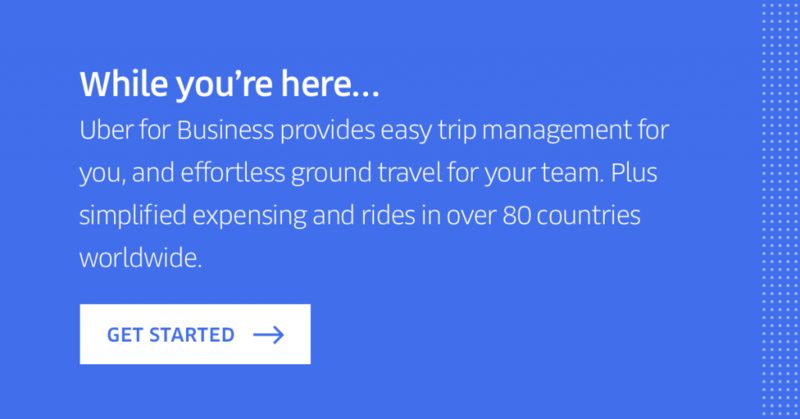 Take action: Explore your automation options with tools such as Uber for Business, which allows travelers to maintain a separate company travel profile and lets travelers bill all trips to a central corporate account, eliminating the need for employees to expense ground transportation altogether. Do you truly know how much time you’re spending on each task? While it may seem like it only takes a few minutes to review, approve, and file an expense claim, but with dozens of travelers company-wide, that time can quickly add up. As you examine new time-saving options, think about how that solution can shave time off the expense evaluation process — time you may not have even realized you’re spending on these laborious tasks. Quantify & take action: If you’re not doing so already, start measuring the time spent on processing expense claims, including sample audits, back and forths to travelers with corrections and questions, and everything else. You may find that the right tools can add hours of productivity back into your company. Travel program savings aren’t just about cheaper flights and slimmer budgets. A cost-conscious travel program understands that time is just as valuable in dollars as the dollars themselves. Time spent on repetitive, time-consuming tasks wastes collective hours of time — time which could be better spent closing the next big deal. Plus, as a travel manager, quantifying time savings across the managed travel process puts travel front and center, creating a smoother and more efficient process for every traveler company-wide. Nobody can put a price on that.